The Rachel's Malimbe was formally described by John Cassin, an American ornithologist and curator of the Academy of Natural Sciences of Philadelphia (ANSP), now Academy of Natural Sciences of Drexel University. 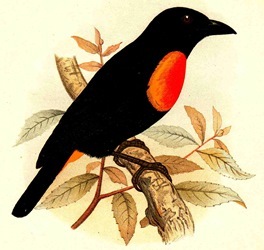 Cassin named this species after his daughter, Rachel: "I name the present beautiful bird after my loved and only daughter. Should her pathway in the world be pleasant, may she know also the great gratification that comes from the pursuit of Natural History..."
The Rachel's Malimbe had been collected by Paul Belloni Du Chaillu, a French-American traveler, zoologist, and anthropologist. Du Chaillu was sent in 1855 by the Academy of Natural Sciences at Philadelphia on an African expedition. Until 1859, he explored West Africa near the equator, especially the delta of the Ogooue River and the estuary of the Gabon. During his travels from 1856 to 1859, he observed many gorillas. He became famous in the 1860s as the first modern European outsider to confirm the existence of gorillas, and later the Pygmy people of central Africa. In addition to his zoological work on gorillas, Du Chaillu collected and identified a number of new species to science, including mammals and the type specimens of thirty-nine valid species of African birds. The first illustration of a male Rachel's Malimbe is by Cassin (1862), a few years after he described the species. The next illustration was a female published by Sjostedt (1895). The nest does not appear to have been illustrated or photographed yet. Sycobius racheliae	Cassin 1857	Prov. Acad. Nat. Sci. Philadelphia, p.36	River Muni (Spanish Guinea). racheliae - After Rachel Cassin (fl. 1857), daughter of John Cassin, who described this species. Rachel's Malimbe (Bannerman 1921), decades after it was first described. The type specimens are in the Academy of Natural Sciences of Drexel University (ANSP 14100, ANSP 14101). Identification. 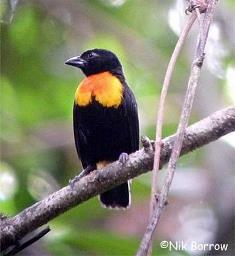 The Rachel's Malimbe Malimbus racheliae has a black face and orange-red crown like other malimbes in its range (eg. Red-vented Malimbe), but it is the only one with yellow on the lower breast and undertail-coverts. 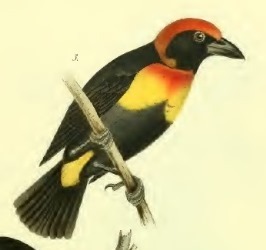 The female Rachel's Malimbe resembles the male but the head and neck are black instead of red. The juvenile is browner than the female with a little yellow on the chin and upper throat, and with a paler bill. 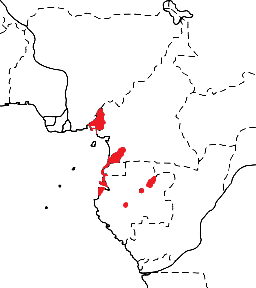 The female Gola Malimbe has a yellow breast while female Rachel's Malimbe has a yellow breast tinged with orange (and ranges do not overlap). Distribution. 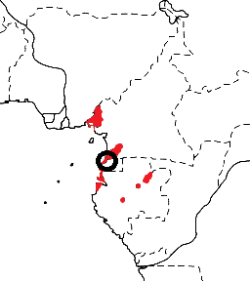 Rachel's Malimbe is found in Nigeria, Cameroon, Equatorial Guinea and Gabon (see map below, based on Birds of Africa. It is very poorly known and has a restricted range, but is not listed under any threat categories, as it is found in several reserves and is not uncommon. Habitat. Rachel's Malimbe inhabits primary rain forest. It mostly remains in the canopy, but may descend in the understorey to 10m above the ground. It also visits the edge of forest in groves of parasol trees. Rachel's Malimbe is usually found in trios, but is also solitary, in pairs, or in small family parties in mixed foraging flocks of insectivores. Trios usually consist of 2 males and 1 female which keep together all year, but accompanied by their young after the breeding season. They have been recorded to bathe in streams on the forest floor. Food. The Rachel's Malimbe feeds mainly on insects, including caterpillars, moths, grasshoppers and mantids. It forages actively in canopy foliage. Breeding. The Rachel's Malimbe is a solitary nester, monogamous, and territorial. 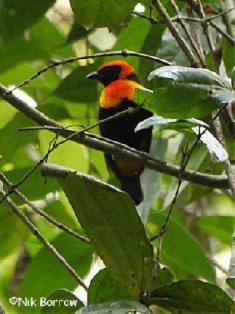 The nest is retort-shaped, resembling that of the Red-vented Malimbe, and is attached to the tips of lianas just below canopy and 8-12 m above the ground over open spaces. At three nests, two males and one female were seen to be building together. Fledglings are fed by a trio of adults, indicating some form of co-operative breeding. No other information about breeding is known and the eggs have not been described.